Dynamics 365 provides a complete solution for designing, publishing, and hosting landing pages on a Dynamics 365 portal running on your Dynamics 365 for Marketing instance. However, you can also create or embed forms on your own external website that submit values back to Dynamics 365 for Marketing. These external pages function similarly to native Dynamics 365 landing pages, so they will generate contacts and/or leads in your database when submitted. However, a few limitations apply, depending on how you implement the external forms. The third way of publishing a marketing page is to place a native marketing form on a native marketing page created and published by Dynamics 365 for Marketing on a Dynamics 365 portal. The following table summarizes the capabilities available with each of these approaches. In Dynamics 365 for Marketing, go to Marketing > Internet marketing > Marketing forms. Create the form and add the required fields to it as usual. Configure all field elements just as you would with standard marketing forms. Make layout and style settings just as you would with standard marketing forms. You can use CSS on your external page to further style the imported marketing form. When you're done designing your form in Dynamics 365, open its Designer > HTML tab to see the CSS classes assigned to each element. Save the form and go live. On going live, a Form hosting tab appears. Open it. In the Related marketing form pages column, select Add new form page (open the ellipsis menu here to find this command if you don't see it). A quick-create flyout slides in. A form page is a virtual page where you can make a few extra configuration settings for forms that will be embedded externally. Use the quick-create form to set up your form options. The settings here are the same as those for a form element placed on a Dynamics 365 marketing page. Select Save to create the new form page and go back to the Form hosting tab for your form. In the Whitelist rules column, select Add new form whitelist rule (open the ellipsis menu here to find this command if you don't see it). A quick-create flyout slides in. In the Name field, enter the domain name of the website where you will host the form. You can whitelist as many domains as you want, but your form will only work on those domains that you whitelist. Select the form page name in the Related marketing form pages column to open its settings and view the embed code. Copy the embed code and paste it onto the page of your website where you want to use it. Depending on what type of web server and CMS system you are using, you may need to adjust the code (for example, by escaping some special characters), or adjust your system settings to allow scripts such as this one to be pasted in. See your web server and CMS documentation for details. Because form prefilling requires the form to fetch contact values from your Dynamics 365 for Customer Engagement database, a few extra security measures are in place to help protect contacts' privacy. This means that contacts need to opt-in for form prefilling and that you must authenticate each external domain where you'll embed the form. The solution only allows prefilled values to be shown to contacts whose contact record has the allow-prefill flag set. Contacts can set or clear their allow-prefill flag themselves using a landing any page form, provided the form includes the setting. 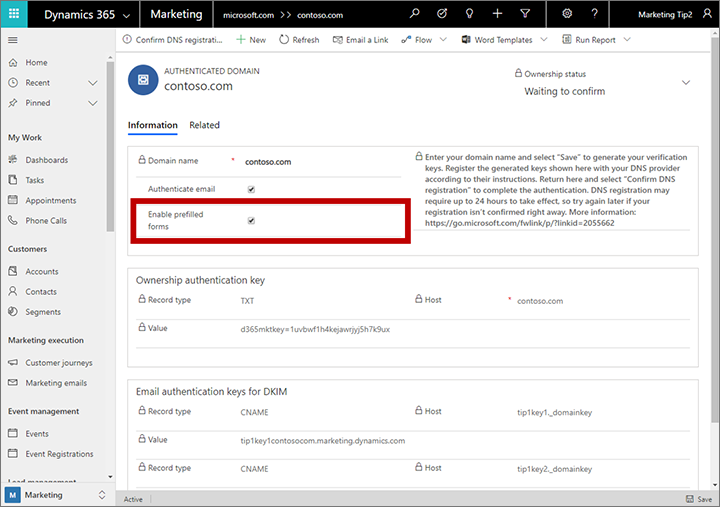 Dynamics 365 for Marketing users can also edit a contact record directly to edit this setting for that contact. Set up domain authentication for the external domain (website) where you will host your form and be sure to mark the Enable prefilled forms check box. You don't need to also enable email authentication on that domain, but you can. For instructions, see Authenticate your domains. Create a form with the required fields and design elements as described in Create, view, and manage marketing forms. Enable prefilling for the form as described in Enable prefilling for forms. Save the form and then go to the Form hosting tab (first available on save) to set up a form page for it as described in Create an embedded form. Note that you don't need to add authenticated domains to the whitelist on the Form hosting tab because authenticated domains provide even better security than the whitelist provided here. You can embed a subscription center form on an external site just as you can a standard landing page form. The only difference is that you must set the Form type to subscription center. Subscription centers require prefilling, so you must authenticate your external domain, set up the form, and embed the generated form code on your page as described in the previous section. 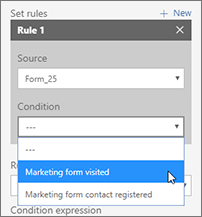 Form capture makes it possible for forms created on an external website to submit information directly to Dynamics 365 for Marketing. The resulting solution works just like a native marketing page created in the marketing app, except that prefill isn't supported. This makes it easier for page designers to create forms that match the rest of their site's graphical design and features, and which also submit values to Dynamics 365 for Marketing. Use your CMS system and other coding tools to design a page with an input form that has the required fields and features. Go to Marketing > Internet Marketing > Websites. Each of the website records listed here (if any) provides both a website-tracking and form-capture code for a specific website or sub-site. Form capture code: This is the form-capture code, which you must copy onto each webpage (or CMS template) that includes a form that you want to capture for use with Dynamics 365 for Marketing. Take a copy of each of these codes, or keep this page open as you continue with this procedure. Return to your externally designed form page and paste the form-capture code you found anywhere in the <body> of the page. The page should usually also include a website-tracking code because this will enable Dynamics 365 for Marketing to collect visitor insights and customer journey triggers to react to page visits or submissions. If your CMS page templates are already set up to place a website-tracking code, then don't add a new one, but if they aren't consider adding the website-tracking code too. Publish your form page to make it available over the internet. Note its URL. Select New form capture on the command bar to create a new marketing form that captures information submitted through a form on your external site. A new from-capture marketing-form record opens, showing the Designer > Enter form detail tab. Enter the Form URL for your external form page and then select Next. The page at the URL you specify here must include exactly one form-capture script, and it must use a website ID for a website record saved on the same Dynamics 365 for Marketing instance as the marketing form you are creating. If you see an error, then check your page to make sure it contains the correct script. The Designer > Select form tab opens. If the page at your URL includes more than one form, then each available form is listed here. You must create a marketing-form record for each form, so if you do have more than one form then you must pick just one of them to link to the current marketing-form record. A Fields preview for the selected form is provided, which may help you identify the form you want. Choose a form (if needed) and then select Next to continue. The Designer > Map fields tab opens. Each field from the external form is listed here using its external label. Fields without labels are hidden fields in the external form. 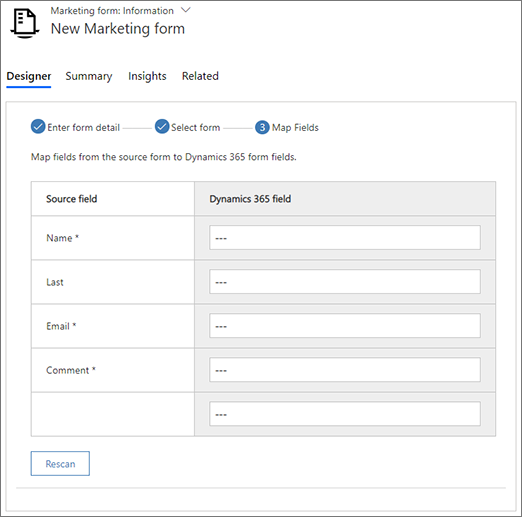 Map each Source field shown here to a marketing-form field in the Dynamics 365 field column. 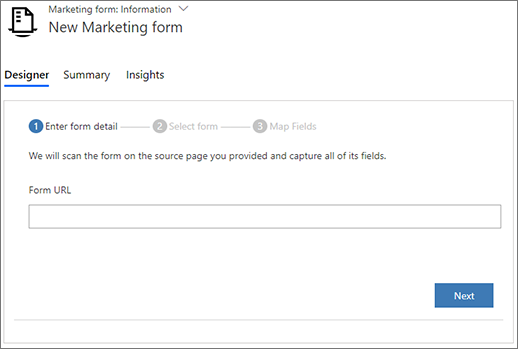 You should already have created all the required marketing-form fields at the start of the procedure, but you can also quick-create missing marketing-form fields from here if needed by selecting New from any of the lookup fields in the Dynamics 365 field column. Each lookup field only allows you to choose from marketing form fields that have the same type as the external field. If you can't find the form field you are looking for, it could be because the types don't match. In this case, either change your external form to use the field type expected by the existing form field, edit the form field type, or create a new form field. If your external form has changed since you last captured it, select Rescan here to load the latest field list. Form-capture forms don't support prefill, so don't try to set up prefilling for them. Select Save on the command bar to save your marketing form. Select Go live on the command bar to activate your new marketing form so that it can begin to accept data from your external form. Open the relevant marketing form record. You can now make changes on the Summary tab as needed, but the field mappings on the Design tab remain locked. If you need to edit the field mappings, select Sync form on the command bar to load the latest version of your external form and unlock these settings. Once you have a captured or hosted form set up, you're ready to start using it in your marketing emails and customer journeys. Here, both hosted and captured forms work in exactly the same way. Unlike local landing pages, there is no design element dedicated to external forms. Therefore, use either a button element or a standard text link to link to your embedded form using its page URL from your webserver. 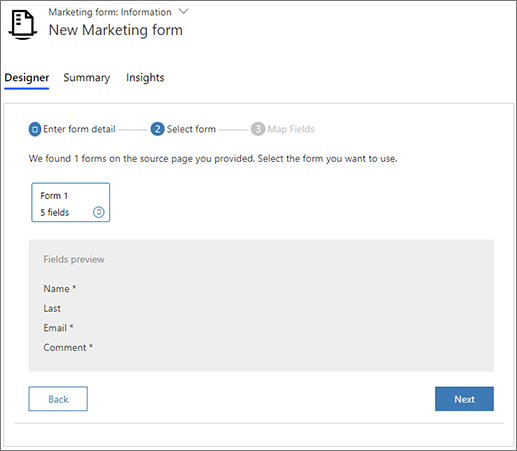 Dynamics 365 for Marketing includes a marketing form tile for customer journeys. It works just like the marketing page tile, both to enable customer journey triggers to react to form visits and submissions, and to create inbound campaigns. Create and go live with a marketing email message that includes a link to the page where you are hosting the form. Create a customer journey as usual. Start the journey with a segment that targets the contacts you want to invite to visit your landing page. At the location where you want the journey to send the message, add a Marketing email message tile that references your message. Drag a Marketing form tile from the Toolbox onto your Marketing email message tile to add the form as a child of that message. Then follow this message tile with a Trigger tile. Select the Trigger tile and open its Properties panel. Select New next to the Set rules heading in the trigger properties. A new rule is added to the trigger. Set the Source to the name of the Marketing form tile that you added to the Marketing email message tile, and set the Condition to Marketing form visited (to trigger when a contact loads the form) or to Marketing form contact registered (to trigger when a contact submits the form). Continue designing your customer journey as required. You can create an inbound campaign by placing a Marketing form tile at the start of a journey, and then configure the tile to reference the marketing-form record that created the embedded or captured form you are using on your external site. This will cause each contact that submits the form to be added to the journey, just as though they had joined a segment targeted by the journey. You could already do something similar for marketing pages hosted on a Dynamics 365 portal, but now you can also do it with an externally hosted marketing forms.